When choosing your windows, there are a number of ways in which you can change the style of the windows to suit your property. This guide aims to describe each of these main choices. 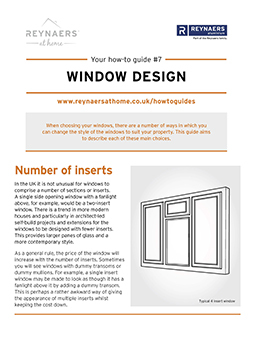 In the UK it is not unusual for windows to comprise a number of sections or inserts. A single side opening window with a fanlight above, for example, would be a two-insert window. There is a trend in more modern houses and particularly in architect-led self-build projects and extensions for the windows to be designed with fewer inserts. This provides larger panes of glass and a more contemporary style. As a general rule, the price of the window will increase with the number of inserts. Sometimes you will see windows with dummy transoms or dummy mullions. For example, a single insert window may be made to look as though it has a fanlight above it by adding a dummy transom. This is perhaps a rather awkward way of giving the appearance of multiple inserts whilst keeping the cost down. It is quite common to have a multiple insert window in which some of the inserts are fixed and some open and close. The opening windows have a frame around them that will not normally line through with the adjacent fixed windows. This is known as having unequal sightlines. It is possible to design the window in such a way that the frames of the fixed windows do line through with opening windows. This more aesthetically pleasing solution is known as having equal sightlines. This is achieved by making the insert as if it were an opening window, but instead of adding a lock and a handle, the window is left without hardware and is screwed shut. It will come as no surprise that this tends to be a more expensive option than having unequal sightlines. The majority of uPVC windows and doors are white but a few colour options are available. The colour may be painted on, but usually is achieved by using what is known as a ‘foil’ that is adhered to the plastic to give it a lightly textured wood-effect finish. There are a number of foils that are designed to look like wood and some manufacturers offer foils in a range of solid colours too. It is possible to have a different finish on the inside and outside, though if you choose to have a wood-grain effect inside and outside, you will generally be able to see the unfoiled plastic when the window or door is open. 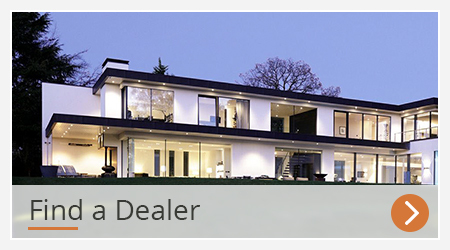 Aluminium windows and doors are usually coloured using a tough powder coating. This is generally available in a range of hundreds of colours including textures and metallic finishes. It is possible to have a different colour inside and out. Glazing bars can be used to divide the panes of glass into smaller rectangles often giving a Georgian style to the windows and doors. A single vertical bar may be used to divide the panes on a vertical sliding sash window and give it more traditional appearance. Whilst the original windows would have comprised individual panes of glass for each section, the more modern glazing bars are fitted to a double- or triple-glazed sealed unit. This effect may be achieved by just inserting a criss-cross matrix between the panes or more realistically with the addition of surface mounted bars inside and out. The spacer bar is the rigid bar that separates the panes of glass in the sealed unit. It used to be made from aluminium and was always silver in colour, but more recently tends to be made from a resinous compound for its better thermal performance. A few colours are available, probably the most popular of which is now black. When fitted with black gaskets, this makes the edge of the sealed unit a single black line with the spacer bar all but disappearing. First and foremost the handles for your windows and doors need to be robust and reliable, but handles come in a variety of shapes, sizes and colours. The perfect handle will feel comfortable in your hand, will turn smoothly and will look great. It is even possible to have a suite of handles that match across all your windows and doors. Several years ago, gold handles were very popular, but more recently chrome and stainless steel handles have taken the lead. The monkey tail handle is a popular choice for windows in more traditional properties, though often this will mean compromising on security as they are often not compatible with multi-point locking systems and tend not to be lockable. It may be worth considering the implications on your home insurance before taking this option. Patterned glass may be used for privacy or for decorative purposes. There are a number of obscure glass options offering varying degrees of privacy that are most commonly used for front doors and bathrooms. Coloured films, lead patterns and bevelled glass designs are all available to add character to an otherwise plain piece of glass. Whilst these have been popular in the past for bay window fanlights and conservatories, they tend now to be used more just for front doors. 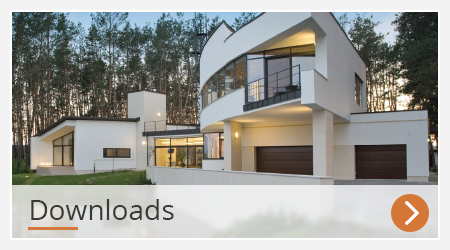 There are a few factors that determine the maximum sizes for windows and doors. aluminium means that it generally can carry heavier and therefore larger panes of glass than other frame materials. The ratio of height to width can be a limiting factor particularly for sliding doors, as a very narrow, tall door panel will not slide smoothly. Other factors that may limit the maximum size include the capability of the factory and from a practical perspective the access to a particular property. Some windows and doors have a double- rebated profile that allows the opening window or door to overlap the outer frame inside and out; on others the opening window or door sits flush with the outer frame. The flush window or door has a more traditional appearance, whilst the double-rebated profile generally offers better weather resistance.